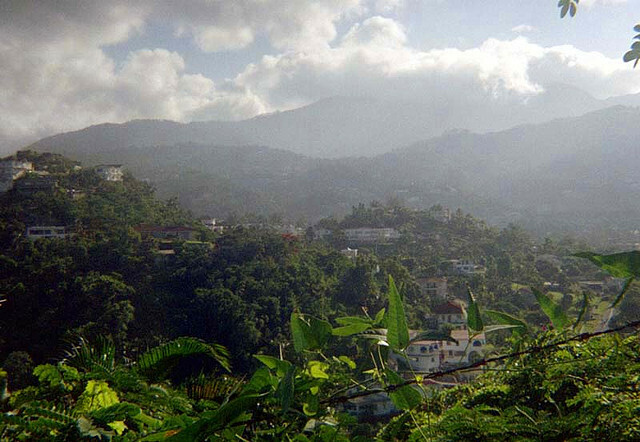 The Blue Mountains that loom over Kingston, Jamaica, are the longest mountain range on the island and they’re a stark contrast to the rest of the island’s gritty capital city. The mountains have a range spanning 45km long and the highest of the highlights, the Blue Mountain Peak reaches 2256m above sea level. Covered in fern forests, surrounded by an azure haze and filled with wildlife many people hike through the mountains to witness the most glorious of Caribbean nature. The views are spectacular. It’s a rambler’s dream. Don’t be fooled by its breath-taking beauty. The Blue Mountains can be a treacherous place if you don’t know what you’re doing or where you’re heading. While no special kit or tools are needed for a Blue Mountain hike those up for the challenge need the stamina to make it all the way to the top. It’s highly advisable to hike with a guide or somebody who knows the route well as trails are rarely marked and you could easily find yourself lost in the mountains for days. When and where to hike? The most popular hiking trail to take is the steep but maintained trail to ‘The Peak’ aka the Blue Mountain Peak. From Penlyne Castle to the summit it’s a 950m ascent which takes up to four hours one way. Most hikers opt for the predawn hike and set out from Penlyne Castle at 2am in order reach ‘The Peak’ by sunrise. After a hearty and much needed breakfast, hikers set out in single file in pitch-black conditions with only flashlights/torches and peeny-wallies (fireflies) to light the way. Amongst cricket chirps the sounds of Reggae music from the mountain’s quaint villages waft through the early morning air. Once hikers have reached the top around 5:30am all that’s left to do is sit and wait for the sun to rise. The mountains are teeming with nature. A hiker’s main focus on the way up is to reach the summit before sunrise (besides it’s too dark to see anything anyway). On the way down however, it’s common for people to stop and stare at the wonderful wildlife. The streamertail hummingbird (the national bird of Jamaica) is a popular bird to search for. Coffee grows best on well-watered, well-drained slopes in the cooler parts of tropical climates, making the Blue Mountains an ideal location for growing it. Blue Mountain Coffee is famous worldwide for its distinctive flavoured coffee that lacks bitterness to it. In fact, every cup of coffee you savour at Couples Resorts is made from the aromatic Blue Mountain beans. Couples Resorts’ award-winning executive chef, Stefan Spath, incorporates the Blue Mountain coffee beans to make his delectable Blue Mountain pot de crème dessert. It’s possible to ask a guide to take you to a coffee plantation where you can witness the cultivation of coffee from coffee cherry pocking to brewing the beans. If you visit Jamaica the Blue Mountains is a must see. Even if you don’t reach the summit, don’t feel like you’ve missed out on the scenery. The experience of traversing though the immense forest festooned with foliage. Don’t forget to bring your camera. There are photo opportunities with every glance.